Last year (5767/07), nearly a month after (our) Pesach, I visited Har Grizim to witness the Samaritans offering the Passover, Pascal Lamb, sacrifice. Mount Grizim is also known as Har Bracha, the mountain of the blessing due to the fact that when the Children of Israel entered the Promised Land, the first thing they did was to carry out the commandment of "the Blessings and Curses". The Tribes of Israel were commanded to split into two groups, one group to stand on Mount Grizim and the other on the facing Har Eval. In the valley in between stood the priests (on what is today the city of Shechem, Nabulus) reading the blessings and curses, facing Mount Grizim for the blessings and Mount Ebal for the curses. As each blessing and curse is read, the people answer Amen. I am going to discuss the Samaritans here. My discussion is off the top of my head, based what I've read, heard and seen. Don't quote me authoritatively -- please check with more reliable sources. You'll also find Google lce these pages with J-man oriented advertisements. It just shows how warped their search engine/ad generator is that they consider what I am writing to be Christian oriented -- as you will read, nothing is closer to the truth. We've established the location of this auspicious blessing/curses event. But what has that to do with the Korban Pesach, the Pascal Lamb. Well, in fact nothing, until you bring the Shomronim into the picture. So first, who are these Samaritans? The Bible reports that following the defeat of the Northern Kingdom of Israel, the Assyrian victors carried out a policy of population transfer, or as we call it today, ethnic cleansing. Their philosophy, as in our times, was that by moving a population to a "foreign" land, they would be easier to subjugate and assimilate. The tribes of Israel were taken away (perhaps to the north-east of their former abode, over the Sambatian River -- but no-one knows where that is; all together, in distinct groups -- historians are divided) and were replaced by another defeated nation from Kuta, further to the north. The Kutis were (forcibly) settled in northern Israel. The area was known as Shomron, Samaria, after the capital city of the Northern Kingdom. The city was built by King Omri (father of Ahab, Ahav who built there a temple to the idol Ba'al), specifically to serve as the national capital (similar to Washington DC, Canberra and Brasilia -- it's amazing how standards, customs and politics that existed in Biblical times still exist today). As Omri bought the city from a man named Shemer, he named the city Shomron. Not long after settling into their "new" homes, the Kutim were attacked by lions. It seems the lions suddenly came up the African Rift Valley -- perhaps a drought had forced them to forage further north than usual (though lions were not unknown in this area during Biblical times). Fed up with their children being devoured by lions, the Kutis complained to the King of Assyria. The monarch understood these attacks may be the result of the fact that the new residents were not keeping the laws given to the Israelites to observe in this Land (sort of illogical, because God threw them out of their inheritance precisely because they were not keeping these Divine laws -- the Assyrians were just God's agents, without knowing it of course -- after all they were pagans, idol worshipers). In order to aid the new population to repel the lions, the king sent some of the former Israelites back to the Shomron to teach the populace the ways of the Lord. So it came to pass, the Kutim (to use modern day rabbinic parlance) were converted to Judaism. They started to observe the laws of the Bible, the mitzvot. And the lions left . . . talk about instant gratification! Now this left the Rabbis (or however the spiritual leaders in Judah, the remaining "Jewish" sovereign entity to the south, at the time were then known) with a dilemma. Were they to accept these new "Jews" or "Israelites" as part of the "nation" (conversion was acceptable at the time) or would they leave them outside the fold as their acceptance of Biblical Law was based on fear of being eaten by lions, and not on the love of the Almighty, Creator of the Universe, as was required for conversion. They took a wait and see approach. While they accepted the Kutim in general, they were reticent to do so fully. So for example, if you hear a fellow Jew recite the end of a benediction, you may answer Amen as is required when hearing a bracha, because you assume he started it from the beginning with the prescribed text and mentioned the names of God correctly. However if you hear a Kuti (the name stuck in the language of the Rabbis, though they now called themselves, Shomronim or Samaritans) recite the last part of a blessing, you may not answer Amen because you cannot be certain he invoked the Name correctly. And other similar situations of partial recognition. The Samaritans occupied the area from northern Binyamin up to the Galilee. Their centre has always been around Mount Grizim. Their population has expanded and contracted over their three thousand year history, reaching a population of over a million at their peak. Today they number less than 800, two-thirds in Har Bracha and the remainder in Holon, south-east of Tel Aviv. For hundreds of years, the Har Bracha Samaritans lived on the outskirts of Shchem, but they have been the subject of persecution by the local Arabs. (The Moslems also persecute the Christians.) In the past they only ascended Har Grizim for religious events. However in light of this Moslem persecution, and despite a personal guarantee of safety from Yassir Arafat himself, they eventually found living in Nabulus intolerable. A few years ago, the Israeli government started to build housing for them on the holy mountain. Today they all hold both Israeli and Palestinian identity papers. When it suited them the Shomronim saw themselves as Jews and when the Jewish people was persecuted in their own Land, they distanced themselves. When the Jews, under Ezra and Nehemiah returned from their Babylonian exile to resettle the Land and to rebuild the Holy Temple in Yerushalayim, the Samaritans did not welcome them. They tried hard to stop the Temple being rebuilt, as this act negated their claim, strengthened when God "allowed" the Temple to be destroyed, that Har Grizim was the Almighty's chosen place on earth. They even plotted to assassinate Nechemiah by drawing him out of the protection of the new walls of Jerusalem. Over the years the Samaritans developed their Bible-based religion and came to "believe" that they were the direct descendants of the Children of Israel entering and conquering the Land of Israel with Joshua. They only accept the Bible as it was at that time (even though they arrived on scene over a thousand years later) namely the Five Books of Moses and the Book of Yehoshua. The Torah does not name the place where the Temple would be built, instead using variations of the phrase, "in the place God will choose". It was not until King David's conquest of the Jebusites that Yerushalayim became this "chosen place". They also do not accept the Oral Law, the verbal explanation of the Torah given to Moshe at Mount Sinai, expounding the written text. This oral tradition was not written down until the time of Rabbi Yehuda haNasi, the Prince, who compiled and edited the Mishna. This absence of the oral tradition leads the Shomronim to a very literal interpretation of the text. For example, the Torah (twice) tells us "to write them on your doorposts of your house and your gates". We interpret this to mean the two paragraphs mentioning this commandment and writing them on parchment placed into the doorpost (mezuzah). 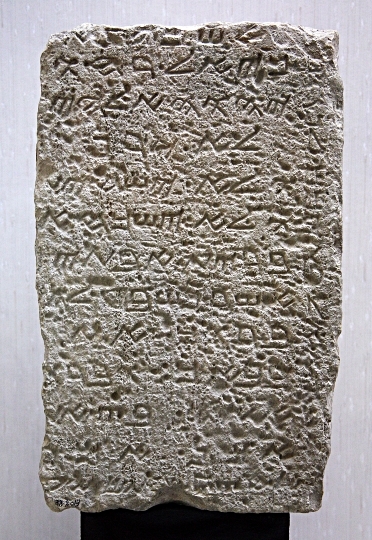 The Shomronim carve a Biblical text into stone. This stone is built into the doorpost. Each person may select any biblical text they like. Another example is the appointment of the high priest. He is described in the Torah as "bigger than his brothers" meaning he is elevated to a higher position above his brothers. To the Samaritans, the high priest is the oldest cohen. The Samaritans have continued throughout their history to center their religious practice around Gerizim (Jabal at Tur in Arabic). In the early years of the Common Era, the Rabbis found the Samaritans worshipping the effigy of a dove on the mountain as part of their religious practice. In response, they proclaimed that "the wine of the Kutim is sacrificial (and thus forbidden for consumption by Jews) and their bread is the bread of Gentiles". Unfortunately, as this proclamation was made during the Mishnaic period, it is not always clear when the Mishna excludes Kutim from a particular action, whether it is before or after their ruling. To further complicate matters, Christian censors replaced the term non-Jew, which often referred to Christians, by the term Kutim or Star Worshippers. So there is a grey area here as well. The question today is whether we consider them halachically Jewish? If they fall under Mosaic Law, we (or they) have a serious problem. As we do not accept their divorce practises, if they are Jewish, they are all in the status of possible mamzerim, and cannot marry into the fold. If they are not Jewish, then they can convert and become Jewish. Today we are unable to sacrifice the Passover sacrifice. While there is not a religious objection, we do not do it. Unlike other sacrifices, for the Pesach we only need the place of the Mizbeach, Temple Altar. The problem of ritual purity does not apply as the Passover lamb can be brought by the ritually unclean if all the Nation is in such a state (which we are). So I guess it is political, but that's for a future blog. As the Samaritans have their altar, they do sacrifice the Pascal Lamb. They do it on their altar on Har Grizim. The do it to the letter, but remember, their letter is literal and not rabbinically sanctioned. But it is interesting to watch. And they know their Bible really well. They are very open in accepting visitors and are prepared to explain what they are doing and, why and how they read it in the Bible. Please have a look at my photographs taken at last year's sacrifice. The photographs are captioned and with the above background I hope you get a feel for the event. Be warned that there is lots of (sheeps') guts and blood in some of the photographs, but in the end they sit down at midnight and eat their barbecued lamb.